In our New Year’s Eve episode, we share a fabulous presentation piece for mini cupcakes that can be used for any small bite you want to serve for your NYE party! Paint the rims of each champagne cup with gold paint. Build your pyramid so you know how the spacing should work. 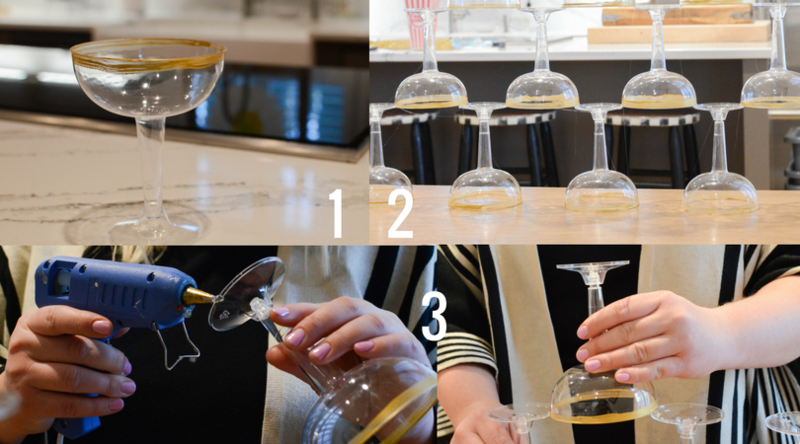 Turn the champagne cups upside down and make a row of 5 cups to create your base. Create the next row by placing a champagne cup in the “gap” between two on the bottom row. 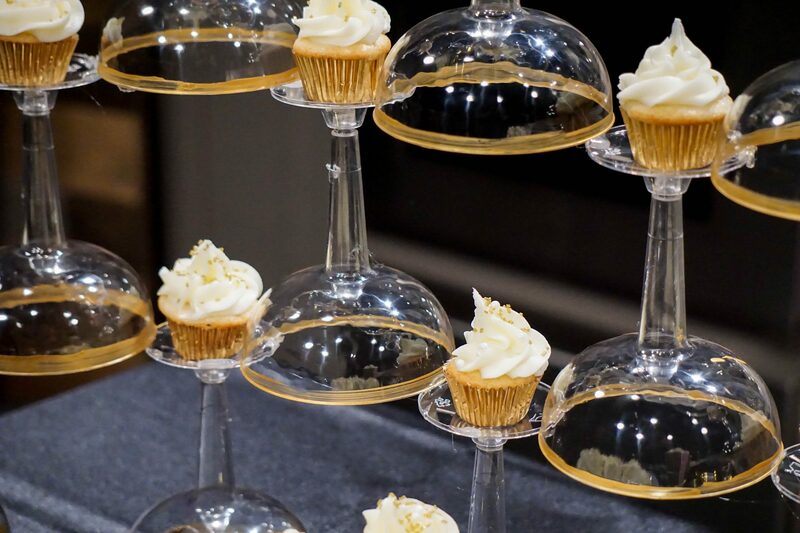 Make sure you leave enough room on the base of each champagne cup to hold your mini cupcake or other small bite. Continue to build the pyramid until all cups are used. You should have 5 rows. Take down all but the bottom row, doing your best to preserve the spacing of the bottom cups. Apply hot glue the edges of two champagne cup bottoms on your bottom row. Place a new champagne cup between the two cups, bridging the gap between them. Continue with each cup until the entire pyramid is built and sturdy. When you’re ready to serve, place a mini cupcake or your bite on each champagne cup bottom. Happy New Year! *Note: I recommend assembling the tower at the location where the party will be held. If you have to make it beforehand and transport it, bring your hot glue gun to fix any breakage.